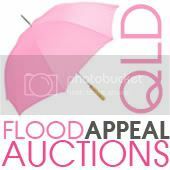 I am sure you have seen about the awful floods in Australia at the moment, well there are some wonderful bloggers setting up giveaways* and auctions in a way to donate to those in need.Toni at Make It Perfect has got the ball rolling and is organising the auctions, you can see what she is auctioning here and Jodie at Ric-Rac is having a giveaway* giving one of her cute elephants and a funky robot, Nic at yardage design is giving a pile of delicious fabrics, and you can win a subscription at Fat Quartlerly. Toni will be listing more bloggers who are getting involved at the weekend. Please pop along and give where you can.